Maps have come a long way from the traditional classroom wall map that many of us grew up with. Online, maps have taken on added dimension with multimedia mashups and a new level of interaction: the information they can deliver goes far beyond topographical features and geo-political boundaries. Here are three maps from three different nonprofit websites: all deal in some way with food sources, but each sends its message in a very different way. The NOLA Food Map is a project of the New Orleans Food and Farm Network. In the aftermath of Hurricane Katrina, New Orleans residents were faced with rebuilding a devastated city. Suddenly, access to food became a challenge of a kind that prosperous North Americans have seldom had to face. The NOLA Food Map was created to show residents in devastated areas where to find food - from grocery stores and restaurants, to farmers' markets and emergency kitchens. The map is a custom version of Google Maps, quick and easy to create and to update. A clickable legend at the left allows users to select criteria to customize the map - to display, for example, emergency kitchens in the French Quarter. 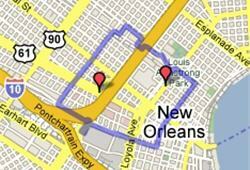 Because Google Maps are so widely used online, the NOLA map interface was immediately familiar to many users, with no lengthy instructions required. Outreach was extended with the distribution of paper maps to various neighbourhood associations, with printable PDF-format maps made available online, and with the option of ordering paper maps by mail. Clicking on "Link to this page" in the upper right corner shows copy-and-paste HTML code to embed the map into any website. The Factory Farm Map is a project of Food & Water Watch, a nonprofit consumer organization concerned with clean water and safe food issues. Their goal for the map was to illustrate the growth of factory farms across the United States, mapping US Census data to show how and where animal production is becoming concentrated in different regions of the country. A companion report gives details of the rationale for the campaign, but the Factory Farm Map is designed to reach people who may never read that report, allowing website users to visualize and absorb the main points of a complex body of information. This map's layout of tabs and menus is complex but fairly intuitive, allowing users to switch between viewing data by number of operations or number of animals, and by type of farming operation; to click on a state and view the data at county level; to hover over a part of the map to see its statistics in a pop-up box, and so on. One limitation to a highly interactive map, of course, is that users must visit the website to experience it. Screenshots and print-outs of the web page can convey much of the same information, but perhaps not with the same effect as when a user is able to explore the map independently in pursuit her or his own special interests. The Seed Map is a project of USC Canada, a voluntary organization working with partner organizations in developing countries to promote strong rural communities, food security, healthy ecosystems, and social justice around the world. 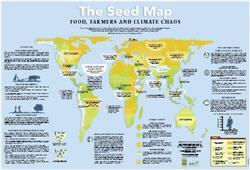 The Seed Map is a teaching and advocacy tool about global food production, biodiversity, and climate change. This colourful map is offered as a free PDF file to download and print, or by mail-order as a wall poster. At present, those are the only options for viewing the map - and this map, of the three examples here, is not far removed from the traditional classroom wall map. It is beautifully designed and rendered, however, and the textual and graphic information is easy to understand. The Seed Map is clearly a work in progress: French and Spanish versions of the original English-only map are set to be released this year, and an interactive website (SeedMap.org) is in development. There are three examples of nonprofits using map - all related to food in some way, but each with quite a different approach and delivery. How are other nonprofits using maps to share complex data related to their cause? Can you see a way that maps might help your own organization to communicate more effectively online? This is an interesting idea. The non-profit that I'm with works with more than 100 projects all over India. It would be neat to have a visual representation of the diversity of locations through a map. @Geoff, good choice! A map is a quick visual way to give that information - just imagine how many words it would take to explain otherwise, and the potential for confusion! @Amita, yes, that would be neat! It would help people to understand the scope of your organization's work, and to identify with local projects. I'd love to hear about it, if you decide to create a map like that. Dan, it's clear that your maps work hard in a very concrete and practical way to do good -- right down at street level, most appropriately. Thank you so much for these inspiring examples. I need someone with experience of using the Google Maps API to help Infoxchange build an interactive map of health and community services in areas affected by the fires in Victoria, Australia. I’ve got the data - tens of thousands of entries - and some experience of working with the API. But not enough, so I’d appreciate someone’s help. Email jking@infoxchange.net.au. Google Maps is already being used to inform Victorians about fire locations - http://mapvisage.appspot.com/fires/FireMap.html.